A young man stands in the back of a church auditorium. It’s another Sunday. Pastor Nolan has preached another sermon, one that contains elements of the same sermon he has been preaching for years. Now it is time for another altar call. “Every head bowed and every eye closed.” Pastor Nolan orders. The young man in the back ignores that edict, not because he’s rebellious, not even because he is now a teenager and an usher in the church at this point – so he has a good reason to keep his eyes open. He does it because he is troubled by something. He wants to know what is really going on in the church that he has been going to since he was five. Matthew Paul Turner and I have a lot in common, despite his being 15 years younger than I and growing up on the opposite coast. 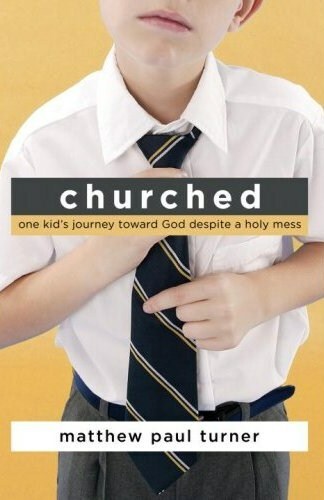 I was also “churched” my entire life. Where MPT (that’s what I’m going to call him because I think it’s cool to use all three of your names and then abbreviate them like JFK) went to a very conservative Baptist church, I was raised in the very conservative Assemblies of God. If the name Assemblies of God rings a bell it’s probably because of the many luminaries of the Christian faith that came from the denomination. Hallowed names such as Jim and Tammy Bakker, Jimmy Swaggart, Benny Hinn, and Gene Scott all started out as AG ministers. In fact when a televangelist or other well known preacher gets in trouble, there’s a good chance he’s AG. So, yes, like MPT I was churched. In fact I was so churched that to this day when a bible speaker says to turn to a particular verse I race to it to try to beat the person next to me like we used to in Sunday School Bible Drills. I don’t stand up when I find the verse though…usually. I was so churched that when I found out that my 7 year old friend was Catholic I tried to cast the demon out of him in the name of JEEESUSSSS!!! I was so churched that whenever I hear a classic bible story like Noah’s Ark or David vs. Goliath I always picture it on a flannel board. OK, that will be enough of that. MPT is one of a number of Christian writers that I’ve discovered in the past couple of years who approach their faith with humor, honesty, and the awareness that the answers aren’t as easy as traditional fundamentalism seems to portray them. For me, discovering these writers has literally been a Godsend. Writers like MPT, Susan Isaacs, Don Miller, and Jonathan Acuff have done more to draw me back to my faith than The Prayer of Jabez, The Purpose Driven Life, and The Shack combined (none of which I’ve read of course, but they sit there on my bookshelf encouraging me anyway). Jesus loves the little white kids, all the white kids in the world. At the age of five, young Matthew and his family were snatched from the satanic – well…Methodist – church that they were going to and placed in the loving arms of the Independent Baptist Bible Church led by Pastor Dave Nolan. Apparently many in the Methodist congregation no longer felt that God was attending a church where the pastor would use Yertle the Turtle as a sermon illustration. Personally, I think the collected works of Dr. Seuss are filled with allegorical meaning for children and adults and are excellent sermon material. From there to here, from here to there, wonderful insights are everywhere. But maybe that’s just me. I’m a big fan of the good doctor. As a recovering fundamentalist myself, I can tell you that there is some comfort in it. Even though it separates you from the mainstream population and makes you “weird,” it gives you a set of clear cut guidelines on most issues. It eliminates gray areas and cognitive dissonance. Most importantly, in most fundamentalist churches, if you have any questions about how to live your life, there are plenty of church folk around who will be glad to tell you. In Churched, MPT describes his journey through the thicket of fundamentalism with honesty and humor of course, but with a surprisingly light touch. Although he skewers some of the conclusions that the people in his church came to, you never get the sense that he holds the people themselves in contempt. All of this makes for a very readable book with just enough cynicism to keep it entertaining, but not enough to make it bitter and unsavory. In the church where he grew up, he obviously was instilled with many worthy values. One of them was honesty, and this is where things began to unravel for him. As he grew older, became an usher, and was privy to more private conversations between church leaders he noticed that the talk of “souls being saved” focused more on numbers and percentages than on people’s lives actually being changed. As he stood in the back of that auditorium that Sunday, his head not bowed, his eyes not closed. He watched Pastor Nolan ask for hands of anyone who wanted to become born again. He watched as Nolan said, “I see that hand.” Five times he said it, indicating five more souls to enter the Kingdom of God that day. The problem was that Matthew, head up and eyes open, didn’t see any of those hands. At the end of the book there is a scene where MPT is talking to the pastor of the church where he currently attends. He confesses to the pastor that he has some questions about some important tenets of fundamentalism and evangelicalism, and he wants to make sure that he and his doubts will be welcome at this new church. This is at the end of the last brief chapter called ‘Benediction’ where MPT talks about trying out different churches. I would like to have seen more about his journey from fundamentalist to believer with questions. Some of this may be fleshed out in his new book Hear No Evil, which I am still reading and will be reviewing here next week. The pastor seemed to understand and welcomed Matthew to continue his faith journey with the congregation. And isn’t that all that any of us can ask for? Okay, now I need to read that book – Good review! But I would really rather hear about how your faith was somehow saved…?? When are you going to blog that, Joe? One more thing : I confess I kinda dig that pic of Jesus carrying the Nazi’s gun. Ya, its a bit messed up, but maybe thats why it holds my attention. My faith is a work in progress, but then so is everyone’s. I said that finding writers like MPT has helped draw me back to my faith. I still have a lot of doubt and a lot of questions, but I’m learning to be OK with that…for now. I’ll try to write more about that, but its a bit like nailing Jello to the wall. Good review…I’m buying the book. When’s your book coming out Joe? Oh…and I’m TOTALLY onboard with your assessment of Dr. Seuss.